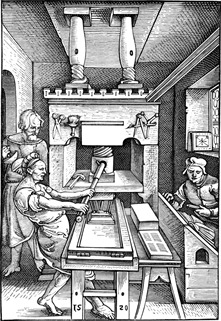 Between 1440 and 1450 in Germany, Johannes Gutenberg was working on making movable type or metal letters that he could organise to make words and, later, use again in different words. He was also busy making a new ink with oil. This ink was clear to read and stayed dark on the page for years and years and years. He invented a printing press too. This was a machine that could push the words and sentences he made from metal letters onto a page. When he put these three ideas together, he had a fast, easy and cheap way to make books. Before Gutenberg’s invention, the only way to make a book was to copy it by hand. It was expensive because not very many people could write and it took months or years to make a new copy. 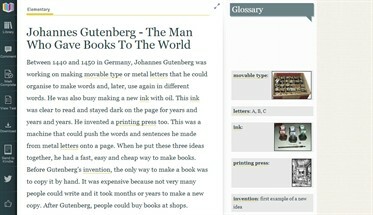 After Gutenberg, people could buy books at shops. But the great American writer, Mark Twain, said, “What the world is today, good and bad, is because of Gutenberg.” His invention is probably the most important in history. For the first time, people could get information. They could read what they wanted – not what the King or their religion said they could read. (It’s true that governments worked hard to stop people reading some books, but they never could. The books became more popular because the King or the President said they were wrong or evil.) In the fifteenth century, there were some hundreds of thousands of printed books. In the sixteenth, there were two hundred million. A hundred years later, there were more than half a billion and in the eighteenth century, a billion. Also, people started to write books in their own languages so that everybody could read them. Until Gutenberg, nearly all books were in Latin, the dead language of the Romans. Of course, most people could not read them because there were not many schools, but before Gutenberg they had no reason to learn. Today, many people think Johannes Gutenberg was the most important man of the second millennium. But we don’t know what he looked like or where his body is. He died poor and unknown.